Look, no one has any money, the weather is crap, and we all need a boost. IN CASE YOU haven’t noticed (or are trying to pretend it’s not happening), it’s January. And that means a few things: You’re tight for cash, your social life has taken a dive, and you’re feeling a bit fragile after all the Christmas celebrations. Plus, you’re probably being inundated by annoying ‘lose the Christmas weight!’ and ‘the detox starts here!’ ads every time you go on social media. And nobody’s got time for that. What you need are simple ways to make you feel soothed, cared-for, and relaxed. Or little things that put a pep in your step and remind you the world’s not so bad sometimes. 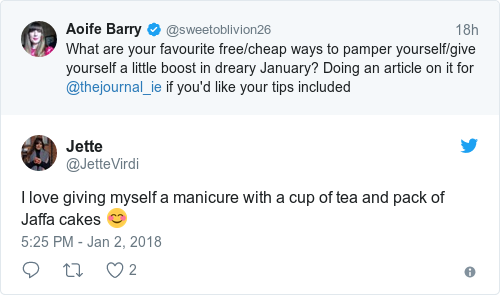 Here are our free and cheap options for you to treat yourself this January – and hopefully you’ll keep it up for the rest of the year. We’re not talking a 30-minute pound of the pavements here. Get out of the office for 15 minutes, take a stroll around the local area, and take some deep breaths. Look around at your surroundings and maybe don’t even listen to a podcast or music. Notice new sights and sounds. This is one of those things that seems like it’s a pain in the arse to do, but once you do it, you are so glad you did. If you are lucky enough to have a bath in your house, then there are loads of great tips for you to make the most of your tub time. (The basics tend to be: something nice to add to the water, a glass of wine if you fancy, tealights, and lots of time to soak). You don’t have to splash out in the supermarket to make mealtime fun. Use Google or your recipe books (or take one out of the library) and make something new using just what you have to hand. You’ll get to feel a bit smug and enjoy the fruits of your labour. Plus – make extra so you can bring the leftovers in to work for lunch. Here’s a recipe site to help you out. And it goes without saying: make something you WANT to eat, not something you feel like you SHOULD eat. And enjoy every lip-smacking bite. Going to see the Turners in @NGIreland (Given to gallery on a bequest that was conditional on the works only be displayed in January due to best light then, or something!). This year they are displayed with works by Irish artist Niall Naessens, so that’s a new twist. If you have an art gallery – small or large, contemporary or classic – near you, go have a look around. If you’re in Dublin, definitely check out the Turner exhibition at the National Gallery, which runs every January. Bliss. Don’t have an art gallery? If there are any art stores, they are good for a browse too. A museum is also another good bet. It costs nothing to join a library, and nothing to take a book out. And your library has everything from fiction to history to poetry to cookbooks there. Now’s the time to take out those classics you’ve wanted to read, or that new book you’ve had your eye on. Taking the Cordelia approach of 5 minutes to do nothing - no email, no social media, no chat, just being. Will nothing come of nothing - quite the opposite, King Lear! Seriously. Take a deliberate 15 minutes – or half an hour?! – and just do nothing. We’ve lost the art of daydreaming, but those idle moments can help your creativity. Also, you’ll notice when you do this how little you actually spend time doing feck all. This one will cost a few quid, but it’ll be worth it. Find a good (key word here – not just any old place) bakery near you, and treat yourself to a baked good for breakfast. Enjoy every bite. 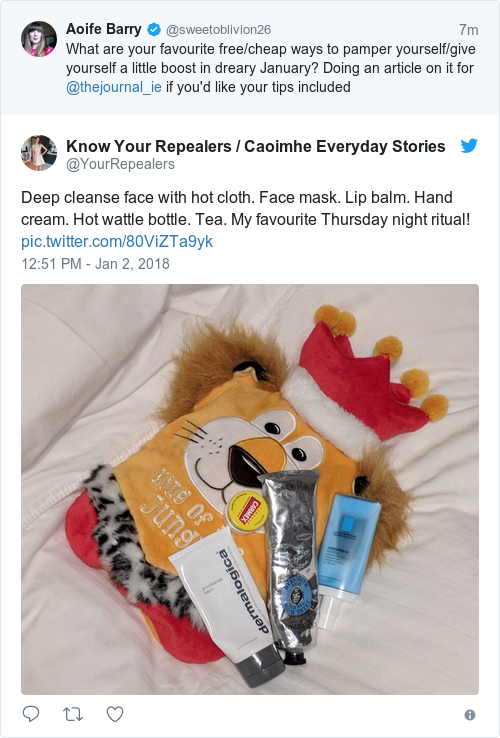 Scout around venues and businesses near you to see if there are any offers on – it might be a spa giving discounted facials, or a restaurant that’s doing a lunch deal. Dublin games venue Token, for example, is doing its cheapskate day for the entire month of january. You get a main course, a side, a pint (or unlimited soft drinks) and 10 tokens to play games for €20. You want to get out of the city/town you live in, but now’s not the time to book flights or pay for accommodation. So take a day trip (yes, you’ll have to pay for petrol here – or take the bus or train) to somewhere nearby and explore there for the afternoon. A lovely one for the weekend when you just need to get some headspace for a while. In a similar vein, getting out into nature will always make you feel good. If you have access to a wood or forest near you, and you’re able to go for a roam, then just do it. Alternatively, a nearby park will work. Take inspiration from the Japanese pursuit of forest-bathing. We all do it – promise to visit someone, or meet them for coffee, and then before we know it three months have passed and we’re a bit morto that we haven’t seen them. So seize the moment this January. Invite them around for tea; meet them for a coffee; or hell, just pick up the phone and give your gran a ring. You’ll get that buzz that only human interaction can give you. Catching up on culture I missed out on over the break – listening to (free podcast) @pchh right now to remind me of the great books, movies, tv and music going on! You probably have the same old podcasts on rotation. So switch it up a bit – try a new podcast and bring something new into your life. You might learn something new, get a few belly laughs in, or just soothe your frazzled brain. Just trying to drink plenty of water every day. It's improving my skin and my sleep - because I'm drinking less tea! Feels weird when i don't have a glass on the go now! I keep a small instrument near my desk like a ukulele or kalimba that I can pick up and play for a few min between emails. That ones fairly job specific though! Wouldn’t recommend it for anyone working in a shared office space! National Gallery. Home-made ginger and lemon tea. The view from the Lexicon Library in Dub Laoghaire. Sunday morning reading in bed. We did a girls day out for less than €30. Free Jo Malone hand massage in BTs, lunch special after in Brasserie 66 and cinema in IFI. Bliss. Clean pjs, clean sheets, new book, early night. Bliss! Bake bread. It's cheap, kneading is fun and as an added bonus you get to eat an entire loaf of bread straight from the oven if you're having a particularly bad day. Get lost in some looking at a gallery or museum. Tickle your vocabulary with some new words. Dictionaries are full of mental thrills. Soak feet in salted hot water (preferably after the above). What are your tips? Tell us in the comments below and share the love. Poll: Are you planning a ‘buy nothing’ break this January? 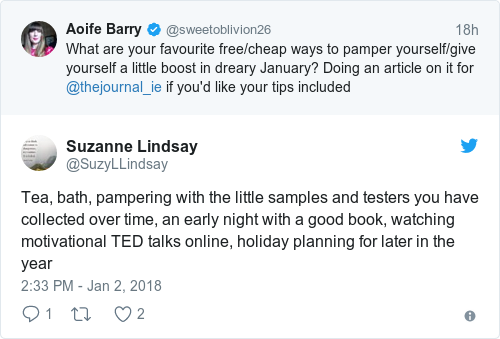 Email “Try these free (or cheap) ways to treat yourself this January”. 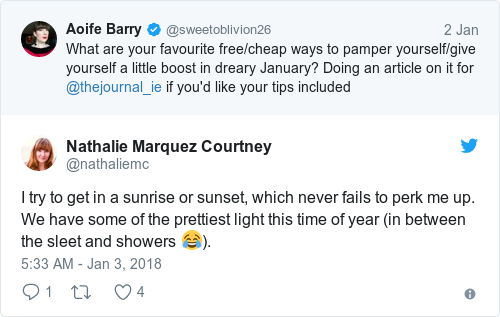 Feedback on “Try these free (or cheap) ways to treat yourself this January”.